Toshiba America Business Solutions is giving Los Angeles Chargers and LA Galaxy fans something to cheer about beyond the action on the field at StubHub Center. The Lake Forest, Calif.-based tech leader completed the installation of one of the most advanced ultra high-definition (HD) scoreboards and ribbon displays in professional sports to complement the record-breaking north end scoreboard installed at StubHub Center in 2014. Measuring 20 by 53 feet, the new next-generation scoreboard delivers an unprecedented 476 by 1,232 lines of resolution to enable even the most demanding football and soccer fans to follow every live-action play and replay in brilliant HD clarity. The new board assumes a prominent position on the south end of the stadium opposite the 5,100-square-foot LED scoreboard – at 36 by 125 feet, the largest scoreboard in MLS. Complementing the latest new board are nearly four-feet-high ribbon displays ringing the stadium and streaming team highlights, player statistics, out-of-town scores and sponsor advertisements in up to 72 by 8,688 lines of ultra HD resolution. “StubHub Center continues to be committed to enhancing our world-class fan experience in every aspect,” said StubHub Center General Manager Katie Pandolfo. “We are excited to work with an industry leader like Toshiba to showcase the new HD screen and ribbon boards inside StubHub Center. 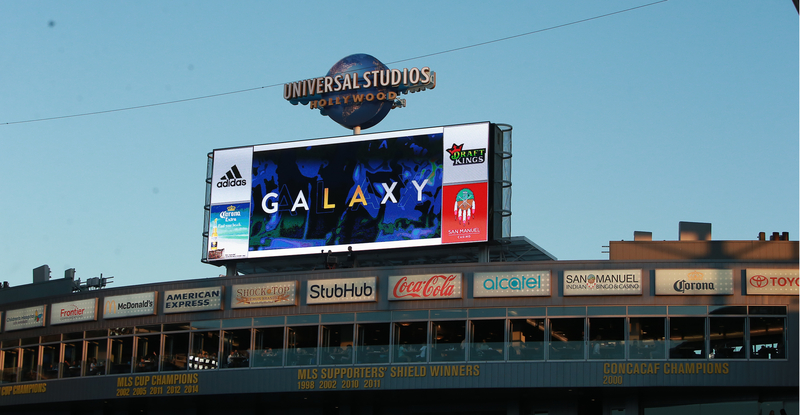 We have invested heavily to upgrade our stadium and this latest scoreboard and ribbon displays take our commitment to the in-game experience even further.” "StubHub Center is the new home of the Los Angeles Chargers and long-standing arena of MLS' most successful franchise, the LA Galaxy, it was important to provide something dramatic for the teams' loyal followers,” said Bill Melo, Toshiba America Business Solutions chief marketing executive. "Together with AEG leadership, we have envisioned and implemented a world-class digital experience for fans to enjoy for many years to come." StubHub Center is southern California’s home of world-class competition and training facilities for amateur, Olympic, collegiate and professional athletes. Managed by AEG Facilities, the $150 million, privately financed facility was developed by AEG on a 125-acre site on the campus of California State University, Dominguez Hills (CSUDH) in Carson, California. StubHub Center features an 8,000-seat tennis stadium, a 27,000-seat stadium for soccer, football and other athletic competitions and outdoor concerts; a 2,000-seat facility for track & field and a 2,450-seat indoor Velodrome – the VELO Sports Center – for track cycling. StubHub Center is home to Major League Soccer’s LA Galaxy, the five-time MLS Cup Champions. StubHub Center is also home of the Los Angeles Chargers, United States Tennis Association’s (USTA) High Performance Training Center, the national team training headquarters for the U.S. Soccer Federation (USSF) and EXOS, an international training center for elite and professional athletes. For additional information, please visit www.stubhubcenter.com. TABS’ Ellumina™ digital signage offering includes all of the hardware, software and services needed to implement dynamic and interactive digital signage installations. TABS provides content creation and management, displays, integration, installation and project management services as well as financing for solutions ranging from a single screen to the biggest arenas and stadiums. For additional information, please visit www.business.toshiba.com.